Alevin: Newborn trout. When first hatched from the egg, alevin have an egg sac attached and cannot swim. They receive nutrients from the yolk as they grow and become strong enough to swim and feed on microorganisms. Baetis: Mayfly genus Baetis, a small but prolific mayfly, the baetis is a very important food source for the trout of the South Holston. Also know as Blue Winged Olives, they are famous for hatching in poor weather conditions, including snow. They are small and delicate as adults. 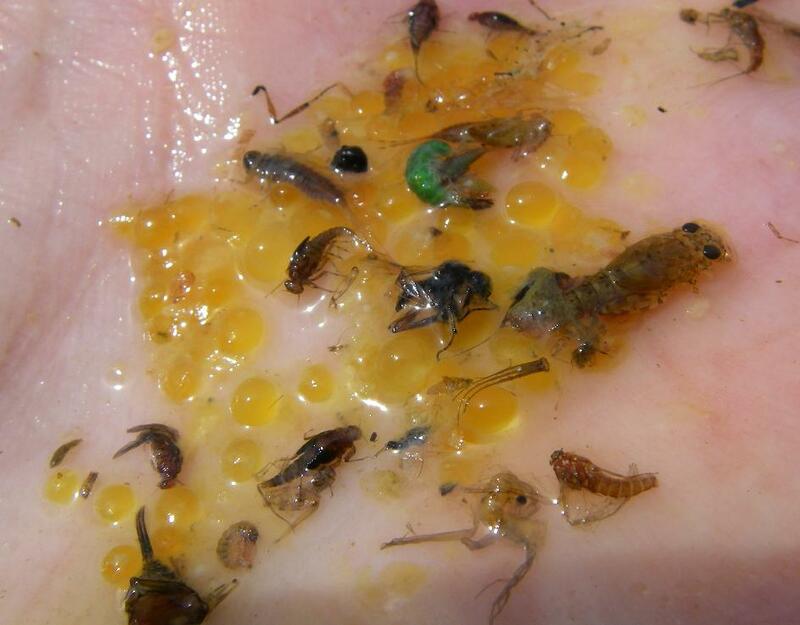 The nymphs are near microscopic when first hatched from the egg, and max out at around a size 16 on the South Holston. Color changes from brown to black as they mature. At emergence, they can be black as coal. Caddis: Mothlike aquatic insect belonging to the order Trichoptera (meaning hair-wing). There are over 1200 different species. Also called Caddisfly, Grannom or Sedge. The adults lay eggs either by depositing them on the surface of the water or by diving down and depositing them on the river bottom. A very important source of food for trout. Caddisflies have complete metamorphosis. A caterpillar-like larva hatches from the egg and grows for approximately a year before reaching maturity and building a silk cocoon. During pupation, the caddis transforms into a pupa, ready to emerge. The pupa is the most vulnerable stage as it is available throughout the feeding column during emergence. The pupa swims to the surface, breaks free of the pupa exoskeleton and emerges to immediately fly off the surface of the water. Unlike mayflies, caddis do not linger on the surface. Some larvae build shelters (called cases) of small pebbles, some build with plant matter, and others are "free living" with no cases. All caddisflies produce silk used to build the cases or create nets to catch food in the current. The South Holston is home to quite a few species and are typically described by size and color as opposed to Latin names. Color and size varies greatly. Color may be cinnamon, tan, brown, reddish, creme or black. Some adults have bright green thoraxes. South Holston caddis size varies from 1/8" to 1 1/4". cfs: Cubic feet per second. A measurement of quantity of liquid flow past a given point or line. A cubic foot of water weighs 62 pound. Therefore, when the South Holston is releasing 2500 cfs, over 77 tons of water are flowing by every second. 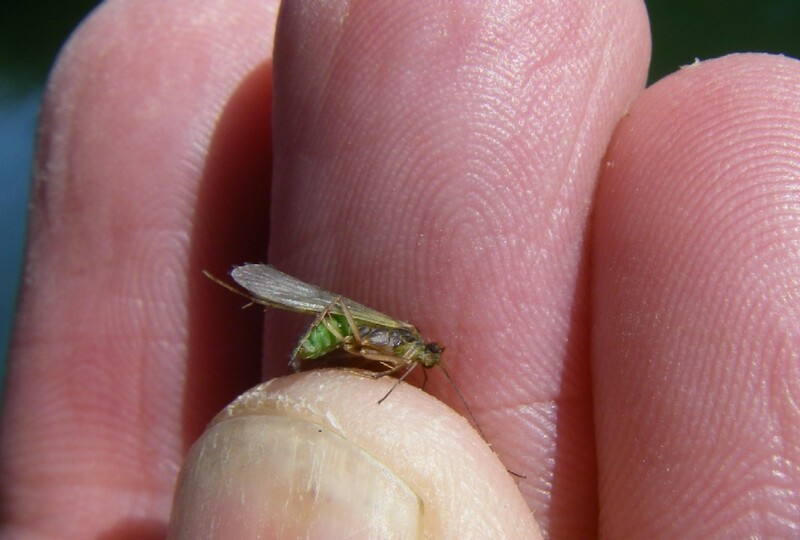 Complete Metamorphosis: The growth process of midges, caddisflies, and many other insects. Egg-larva-pupa-adult. Dry-dropper: Fishing rig combining both a dry fly and a nymph or wet fly fished below the dry. Typical rig would consist of the dry fly tied to the leader and a section of tippet tied off bend of the hook to the nymph. Gastric Lavage: Also know as a stomach pump, the process washes out the contents of the fish's stomach via irrigation. As fish do not breath through their throats, it is not comparable to a human stomach pump. Incomplete Metamorphosis: The growth process of mayflies, stoneflies, dragonflies and some other insects. Egg, nymph, adult. There is no pupal stage. 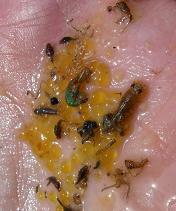 Instar: A developmental stage of insects between molts. Mend: Using the rod to manipulate the line to change the drift of the fly, usually to add slack line for a drag free drift. Metamorphosis: meaning "change of form", the process of growth through dramatically different stages and forms of an insect. 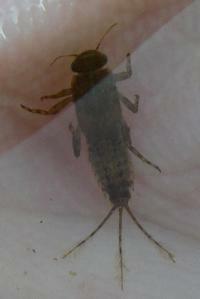 Nymph: A sexually immature stage of incomplete metamorphosis. For our purposes, we are looking at mayfly, dragonfly, and stoneflies. From the egg comes the nymph. As it grows, it molts and sheds its exoskeleton. Each growth stage is called an instar. When the nymph is ready, it breaks out of its exoskeleton one last time, but now in the form of a flying adult. Personification: The application of human mental or physical traits to nonliving things or nonhuman species, such as trout. Pupa: The stage of metamorphosis after the larval stage and before the adult stage. The pupal stage is usually very vulnerable during its brief accent to the surface for emergence. Only insects that have complete metamorphosis have a pupal stage. 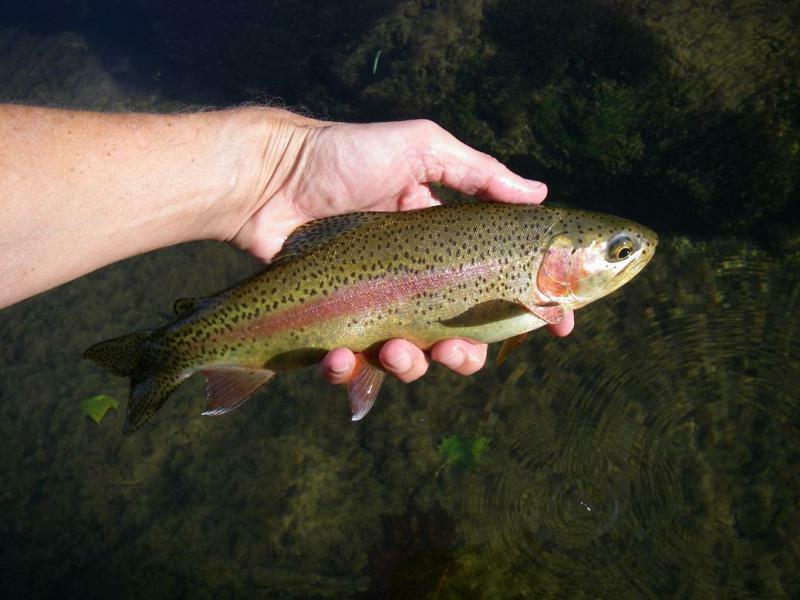 Rainbow Trout: The most common species of trout in the Southeast, rainbows (or 'bows) are both stream born and stocked in the South Holston. The are easily identified by a wide pink band down their sides. Scud: A small, shallow water dwelling crustacean, Crustacea Amphipoda Grammaridae. On the Scuds are a very important food source on the South Holston and is a major factor in the health, strength, and brilliance of colors for the trout. They are often dislodged in faster riffles. Trout can be seen rooting around grass dislodging them as well. Scuds eat mostly plant matter and are most active at night. They are similar to shrimp. An unfed scud is almost transparent. After feeding, they are translucent and take on the color of their meal. If a scud eats dark green grass, then he will appear dark green. Most scuds on the South Holston are gray or olive and between 1/8" and 1/4" long. When they die, they turn orange just like a boiled shrimp! See the video page for a scud video. Sowbug: Also know as cress bugs, these crustaceans are similar in appearance to scuds, but are flatter. Unlike the scud, sowbugs do not swim, but crawl. They are usually grayish black. Spawn: The reproduction process of building a redd, laying eggs, fertilizing the eggs, and protecting the redd until the fry hatch. Used as a noun, spawn refers to eggs or an eggsac . Sucker: A type of fish distinguishable by its downturned mouth. 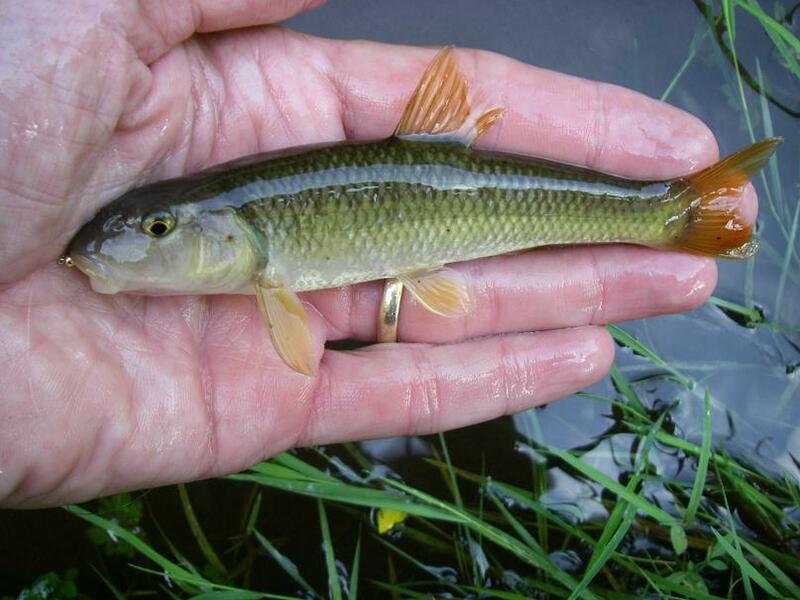 There are quite a few species of suckers in the South Holston and surrounding waters. Some of them grow quite large. Suckers are abundant in the South Holston and their eggs are an important source of food during the sucker spawn. See pic. Sulphur Mayfly: Ephemerella Dorothea or Ephemerella Invaria mayfly, an extremely important South Holston insect. The sulphur mayfly is a crawler and is somewhat wide, thick and flat. It is usually mottled brown in color and no larger than size 14, with most size 16 and 18 at their largest immediately before hatching. The adult has a light yellow abdomen, hence the name sulphur. The sulphur hatch can be an epic South Holston event and can continue pretty much daily for months. Hatches usually occur in the early afternoon, but can happen at any time. Watauga River: Watauga is an Indian name meaning "beautiful water". When you see the river, you will know why. Although many miles of the river travel through poplated and even comercial areas, there are nice stretches to be found without another soul in sight. Expect emerald green pools and runs with brawny rainbows and browns. 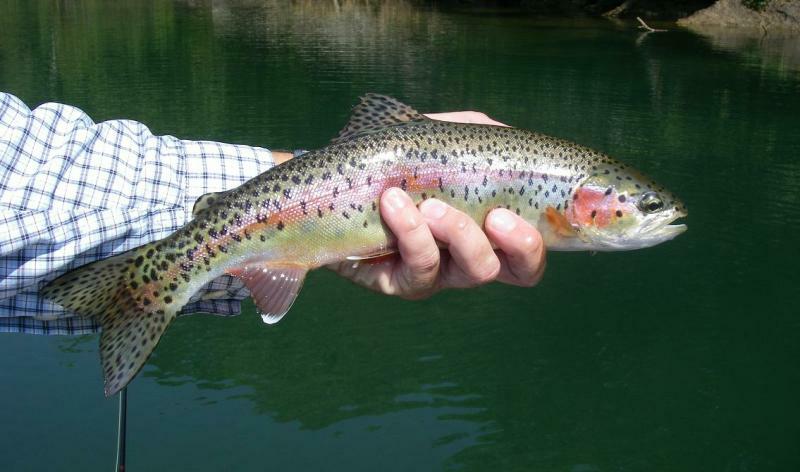 Only 20 minutes drive from the South Holston, it is a fine fishery in its own right. It is a great option when you are ready for a change of pace or water conditions are less than ideal on the South Holston. Weir: A low dam that slows the river flow. The cascading flow over the weir adds dissolved oxygen to the water. This small sucker took a nymph as they commonly do.